Defiant defender Leon Barnett believes the Cobblers ‘can win the league’ despite their underwhelming start to the Sky Bet League Two campaign. 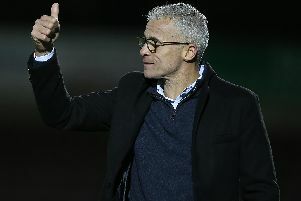 The former Norwich City and Wigan Athletic man feels the Town team is ‘probably the best in the league’, and that in time their quality will rise to the top. After four games of the new season, the Cobblers find themselves above only Notts County, Macclesfield and Cheltenham in the table, having drawn two and lost two of their opening four matches. The second defeat came in depressing fashion on Tuesday night, when they went down 1-0 to a Morecambe side that lost all four of their previous games, without scoring a goal in their three league defeats. Town’s three previous league encounters this term at least saw them show promising signs, but there was very little to smile about at the Globe Arena. Manager Dean Austin even admitted that his players had been ‘out-fought, and out-worked’ by the Shrimps, who jumped above Town in the table. Town now face what looks a testing trip to an unbeaten Colchester United side, who on Tuesday night defeated Crewe Alexandra 6-0 - the same Crewe side that hammered Morecambe 6-0 on the opening day of the season! But Barnett insists he isn’t concerned at Town’s early-season teething troubles, and insists the team will come good. “You look at the team we’ve got and I think it’s probably the best in the league,” said Barnett, who played in the Premier League for the Canaries and Wigan. “We say it to ourselves in the changing room. “It’s disappointing not to get a point from the game on Tuesday. “We had a few good chances at the end and it’s a tough one to take. It hurts. “But there are loads more games left. “We’re only four games into the season so I think everybody is now looking forward to the Saturday game. We’ve got to take the positives and move on. It has hardly been the start to the season the Cobblers were planning following their relegation from league one in May. You would imagine confidence is low in the Town camp, but Barnett suggests otherwise, and insists no other team in league two concerns him. “I don’t think anybody fazes us,” he said. “I look at our team, and I say it to the boys every week, I don’t think I’d swap any of them. “I look at our team and think we can win the league, even after this start. “We will go and get the three points on Saturday - I don’t see us going there trying to settle for a draw.